Being in a relationship with one of the hottest and most talented male surfers on the circuit is a dream come true… right? 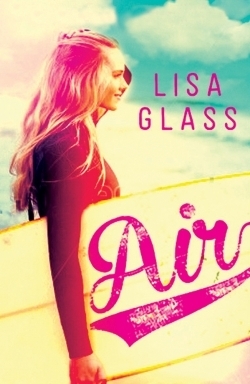 Iris and Zeke get to travel to the most beautiful beaches in the world, competing in major surf competitions. Life should be perfect, but when Zeke is suspended from a surf tour in Hawaii, it’s clear there is some deep trouble in paradise. And then there’s Zeke’s romantic past: at every turn Iris is confronted by his old flames and his hordes of female fans. Returning to Newquay, Iris finds that at home things have also changed. Her friends have moved on with their lives, and they sense Iris is keeping something – something bad – from them. What really happened in Hawaii? Why was Zeke kicked off the circuit? And what secret is tearing Iris and Zeke’s relationship apart? A quick review today because I don't want to spoil anything. If you loved Blue you will adore this book too. Air follows their story as they go off to America surfing in competitions and promoting various surfwear labels professionally. I loved getting back this world and them and becoming immersed in it all once again. I don;t want to say too much that goes on but I am guarantee if you are anything like me you'll finish it and be incredibly frustrated because you'll want to move onto the next book straight away.